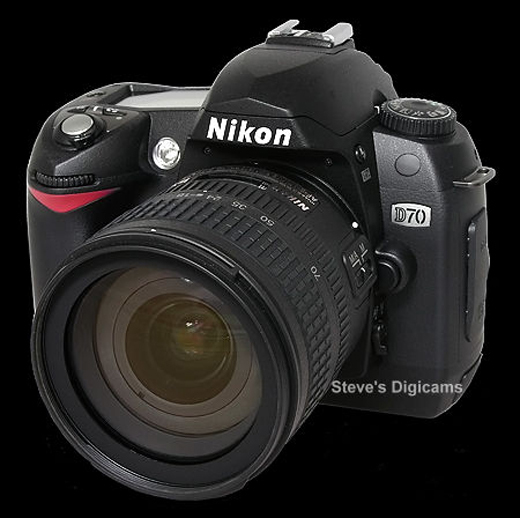 Introduced in 2004, the Nikon D70 became the pivotal camera of the time because it both broke the $1000.00 price point and bested the similarly priced Canon Digital Rebel introduced the previous year. The 6 mega pixel sensor was pretty much the edge of Nikon's envelope until the D2X nearly doubled the mega pixel count to 12.8. In my opinion it is the digital counterpart of the venerable 35mm Pentax K1000, an inexpensive first camera for thousands of photographers. If you're curious about what state of the art was in 2004, check this original review. The D70 was discontinued when it was replaced by the D80 in late 2006. D70 bodies show up on eBay and in camera stores that sell used equipment. Before purchasing any D70 or D70s, be sure that the serial number starts with the number "3", the number block reputedly reserved for camera imported by Nikon USA. This may come in handy if you every need servicing or decide to have repairs done. This is especially important when purchasing a D70 (but not the D70s) due to some quality control issues in early production cameras. Click here for a service bulletin that describes the problem. Click here for some comments on the malady nicknamed the Blinking Green Light of Death (BGLOD). I have several D70 bodies and have experienced this failure in one of my cameras. And it was repaired for free. You may get lucky, too. Addendum: There is also a firmware update for the D70 that will improve the camera's performance. Click here for more information. In spite of its seemingly unimpressive specifications, I use my D70s frequently, and often on outdoor assignments for the paper when the camera's unique qualifications trump its weaknesses. “Outdoors” is the operative word here, because the relatively high level of ambient (sun) light minimizes some of the camera's shortcomings. The camera’s focusing system is nearly 10 years old, and not as sensitive or responsive as the focusing engines found in newer cameras. However, open shade provides more than enough light for the D70 to assure usable response times. The relatively higher ambient light levels allow for lower ISO settings. With the ISO set to 200, noise is at an absolute minimum. High ambient light levels allow the photographer to select lens apertures on the small side of F 5.6. In bright sunlight, the Sunny 16 rule suggests that a photographer with an ISO setting of 200 and an aperture of 5.6 would set the shutter speed at an action-stopping 1/1600 of a second. Under the same conditions, setting the shutter speed to 1/200 allows for a corresponding aperture of f 16. Wide Angle Lens: This was almost always a Tokina 12-24 f4, a relatively slow but sharp lens. Lately I’ve been carrying a Tamron 10-24mm f/3.5-4.5. The latter is definitely a outdoor lens, as its wide-open performance is fair at best. Stopped down, it picks up considerably. Normal Lens: I normally carry the Nikon 18-70mm f3.5-4.5G, the standard kit lens for the D70. The lens is a satisfactory performer. Long Lens: My hands-down favorite is the Nikon VR 70-300mm f/4.5-5.6G. Speed Light: One Nikon SB-800 is carried in a side-care pouch on the camera bag. I also carry flash cables and filters, should they be needed. Miscellany: 2 spare batteries, 2 spare 4 gig CF cards, a small multi-tool, a notebook, and some pens. This kit, carried in a Tamrac messenger bag, weighs only 10 pounds. If I am on assignment, I normally add a second body, allowing me to have instant access to two different lenses, and a backup if something goes awry. 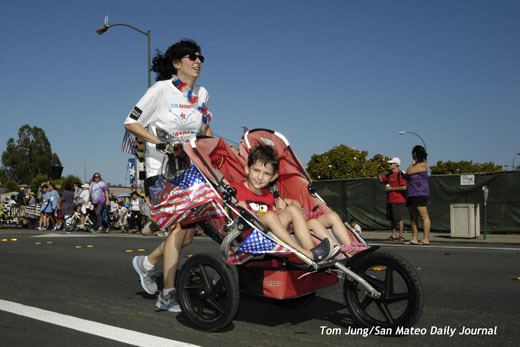 July 4, 2012: I was sent to bring back a "Fourth of July" image from the Redwood City parade. 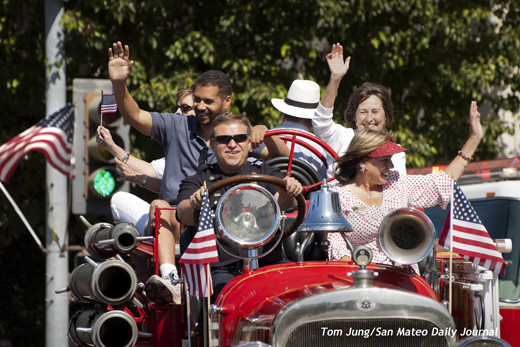 Using my long lens, I made a very simple photo of a "senior" fire engine in the parade. Simple shot, made from from some distance away. Slam dunk easy. This following shot shows the greatest single advantage of the D70 body: The high flash synchronization speeds. The native speed is 1/500 of a second, a full stop faster than the native sync speed of any current Nikon DSLR. (For the moment, let's not discuss Nikon's High Speed Synchronization). I did not submit this shot for publication, but it was one of the photos taken during the assignment. This was pretty much a straight shot. Shoe mounted SB-800 is hot-shoe mounted and set to iTTL metering and an exposure compensation of plus 2/3 stop. The D70 exposure settings were 1/500 second at f 16 with an ISO setting of 400 and a Cloudy preset white balance. In some ways the shot is counter-intuitive, since the highlights, fortified by the speed light, could be over exposed, and the shadows slightly under. It works here because the slight underexposure of the highlights would receive a lighting "boost" from the flash fill. Using a wide angle lens allowed me to get close enough to the subjects for the flash to provide enough power to properly illuminate the scene. Direct sunlight exposures will always present exposure challenges. In spite of the fact that the shadows are nearly as bright as the highlights, the image is, in my opinion, "properly exposed" because there are no hot spots and there is plenty of detail in all of the important shadow areas. The most important quality is that the imaged doesn't look overly "lit". This image would reproduce well.